Well, today – yet again, I’m here to prove that myth WRONG.. And to show you how EASY (and delicious) it is to cook healthy meals, in record time. 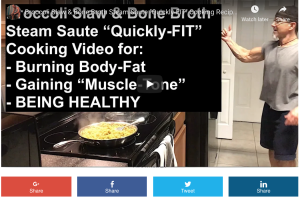 In this candid, on the spot, “Quickly-FIT” healthy recipe cooking video I show you how simple it can be… Unscripted, unedited, unrehearsed. Click ‘play’. You’ll notice I’m using this high-protein chicken bone broth from K & F (I have them on autoship, so I always have some on hand). And since my protein intake was lower earlier in the day, you’ll notice I ‘steam fry’ a frozen organic beef burger, right in the same pan as the veggies as they are in the final stage of cooking. It’s important to note – I only eat red meat, maybe once every 3 weeks, give or take a little. I mention that because there will be readers who are curious. If that sparks any more questions, please do post in the ‘comment’ box below. PLEASE use the colorful buttons below to share today’s post wherever you wish, with whoever you wish. So let’s spread it around, eh? 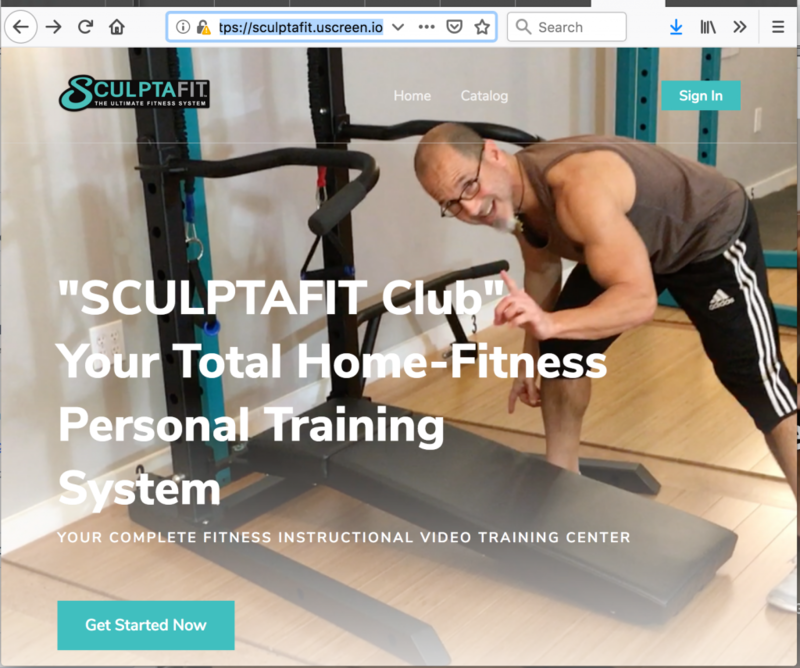 These are the “first generation” of Personal Training videos that are going into the “SCULPTAFIT Club” Home-Gym & Family Fitness Membership Portal. While most of the Personal Training Videos, “Quick-Fit” Cooking Videos and Special Bonus videos won’t be public – I’m sharing a few here as an early preview for anyone who is interested in the SCULPTAFIT Home-Gym & Fitness System AND to ask “Founder Buyers” for your direct personal feedback in the ‘Comment’ box down below. Please keep in mind – While the site is live and ready for you to ‘enter’ – there are 4 videos in there as of today. But next week (and every few weeks after) we’ll be adding more and more videos for you. 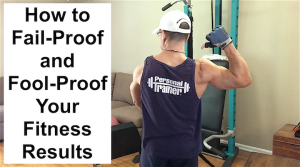 As always – any questions, comments or thoughts, especially your candid feedback on the Personal Training Videos above – just post below. In this video I take you through the “Candid-Cam Close-Up” Walk-Through so you can see the commercial grade quality of all the components as listed below and how they work together. The PRO Model is made for higher-volume, professional club, studio, facility-setting usage for Personal Trainers, Physical Therapists, Sports Medicine Centers, Fitness Coaches and Wellness Clinics – and is built with the thicker, 11 Gauge Steel and 3/8-inch Plate Steel. 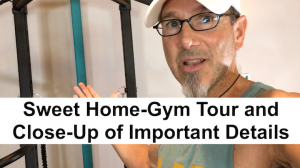 As always, if you know someone who will appreciate this Home-Gym Tour “Close-Up” of the SCULPTAFIT All-In-One Bodyweight Home-Gym System 5.0 then please do share this with them using the ‘Share’ buttons below. And…. And if you have any questions, comments or thoughts – please post below, you know I love hearing from you. If you just want the “Atlas Words of Wellness Wisdom” just fast forward the video to the 6:45-minute mark and listen…. If you want to watch the 4 ab and core exercises I demonstrate, just watch it from the beginning. Then at around almost 7 minutes into the video (6:45 mins) I go into another Mindset Mastery Monologue. Click play – enjoy and then share it using the colorful buttons below. There must be at least one person who will appreciate seeing and hearing what I share in today’s Atlas Candid Cam video. Any questions, comments or thoughts? Then post in the comment box below – you know I love hearing from you. If you’ve seen any of the previous lower-body training sessions – you may notice a few subtle variations in this one. For example – you’ll see that I do the single leg squat (pistol squat) using the Independent AV Handles, instead of doing them totally freestyle. 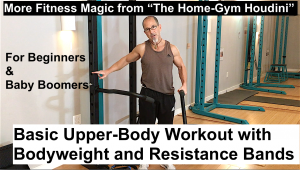 The reason I did that in this lower-body workout was to give myself a little variety, and to show you how the SCULPTAFIT 5.0 Home-Gym System is specifically designed for helping people do exercises that previously required “make-shift” solutions. Using the AV Handles is just one example of that…. We call it “Intentional Design”. And over the next few weeks I’ll share other specific examples of how certain aspects of the SCULPTAFIT Home-Gym were designed with specific intent – in order to allow for certain exercises and workouts to be done naturally and safely. – No need for any of those high-risk, injury-causing type of exercises. Gentle and safe gets it done – when you do it properly. 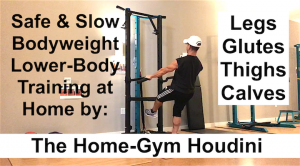 Watch the video above to see what The Home-Gym Houdini is talkin’ about. Any questions, comments or thoughts? Just post below, because you know I love hearing from you. And if you can think of one other person to share this with – just use the colorful share buttons below. The more people we reach – the more we can help. 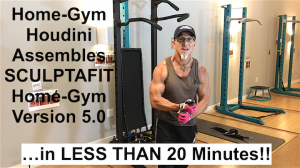 If you’ve been following the story, you know that right after I did the SCULPTAFIT Version 5.0 Home Gym Set-Up and Assembly I then took a short snack break and came back for my first official workout on it. I did a short Arm workout for Biceps, Triceps and Forearms, with just bodyweight and resistance bands (SCULPTABANDS). And I let the camera roll as I went through the training session. Candid style, as usual. Here it is. ==> If you are outside the lower 48 States in the USA – then reach out to me here for a custom shipping quote to your exact country/address. And if you have any questions, comments or thoughts at all – please post in the open Comment below. I’d love to hear from you. And if you know someone who would benefit from seeing today’s video and learning about “the right way” – then please use the colorful ‘Share’ buttons below to get this to them. 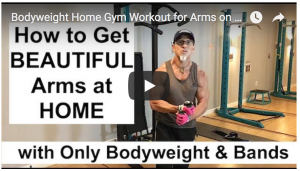 Unlike the previous Home-Gym Set-up video (SCULPTAFIT Version 4.0), where I had Nikki help me with the assembly – I dared myself to “do this one alone”.. SOLO. And as usual, I astounded myself, seeing that it took me just under 20 minutes to get the entire home-gym system together, and ready for action. MOST other mass-market home-gyms take hours and hours, sometimes an ENTIRE, frustrating, weekend!! And that stinks! As always – if you have any questions, comments or thoughts, please post below. I’d LOVE to hear from you. This means fail-proofing and fool-proofing your exercise method, your nutrition habits and your mindset. Fail-proof by simplifying things. NOT making things complex or more complicated…. SIMPLIFICATION brings profound benefits. I’m thankful you’re here and grateful you give my “rough around the edges” material a space in your mind and in your life. I have 1-or long-distance coaching posts opening in about 2-3 weeks – and I can get you on the waiting list for one of those spots. It’s the perfect time of year and even more, it’s the perfect time of your life to do the right thing for yourself. 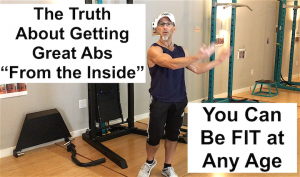 Think of at least one person who needs to hear this episode of Weekly Workout Wisdom and share it with them right now… Email it to them, use the color buttons below – or just go post the link on your facebook page..